With the expected release of Bugatti Chiron to be somewhere in 2017, car lovers got treated with the Bugatti 16.4 Grand Sport Vitesse La Finale 2015. The model is indeed the one to step after Bugatti finished selling 449 Veyron in it’s a decade history. The 450th Bugatti Veyron apart from these holds numerous other features that make it special. We here would like to share that the model has already been sold to ‘someone in Middle East’ but it’s the car lover’s curiosity that brought you here with us. 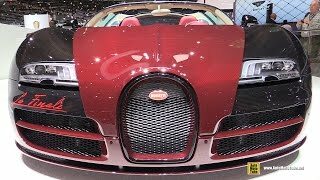 So let us take a step ahead and see what makes the Bugatti 16.4 Grand Sport Vitesse La Finale 2015 stand distinct in the market and yes, ‘worth Millions’ as well. The interior of Bugatti 16.4 Grand Sport Vitesse La Finale 2015 is impeccably unique, all upholstered in Silk beige leather accompanied by the red in color armrests, instrument panel, dashboard and the steering wheel rim. With each one of these adding to the next level contrast, making the interior an unmatched view. The center tunnel, door panels and seat shells some in exposed red carbon fiber while the headrests get the ‘La Finale’ lettering embroidered. The interior also gets joined with a red exposed carbon-fiber made Bugatti elephant on stowage compartment cover. 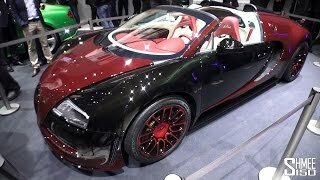 The exterior of Bugatti 16.4 Grand Sport Vitesse La Finale 2015 gets its inspiration from the 2005 first Veyron, with the dark shades of red and black. The carbon fiber works in making the body gets separated by its color variants, precisely the red carbon-fiber and black carbon-fiber. While on one side the doors and the area between them, with front wing panels and side air intakes are made from the black carbon-fiber, the rest in exterior gets adored with red carbon fiber. To add more in the glory, this last Veyron turns to be the first to have air scoop and intercooler cover painted black, as till date they came with silver finishing. Another special feature and the one incorporated specially in this one and also won’t be noticed ever again is ‘La Finale’ embossed under the front head lamp and the rear wing in Red ink. Just like the released Veyron Grand Vitesse the Bugatti 16.4 Grand Sport Vitesse La Finale 2015 also gets it power through 8.0 liter, 16 Cylinders engine producing 1,106 Hp and 1500 nm torque. The Grand Sport Vitesse La Finale 2015 is able to make the 0-62 mph sprint in just 2.5 seconds and holds the world record of 267.85 mph under its hood.